So we decided to build our raised garden bed out of the cheapest stuff we could find: concrete cinder blocks. The bed soil didn’t end up being much higher than the rest of the yard, but having a little barrier did help a bit when it came to retaining moisture and keeping the weeds out. What I was really interested in trying though, was actually planting something in the spaces of the little holes on the concrete block. Would they act like little pots? Would the space be too small? How would the water drain or collect in it? I started filling them in with sand on the bottom and a mix of sand and top soil at the surface – this lets most of the excess water drain down but right after a heavy rain it is still a bit soggier than the rest of the garden. I tried a few combinations. Oregano in rich soil did two things: first it started drowning, and then it burned out when the sun got too hot. On looking back, it seems I should have given the oregano the driest and shadiest place I could find. Oops. Chives didn’t do too well either. Concrete does have a bad habit of amplifying heat around it, so they also dried and shriveled up when the sun got too bright. 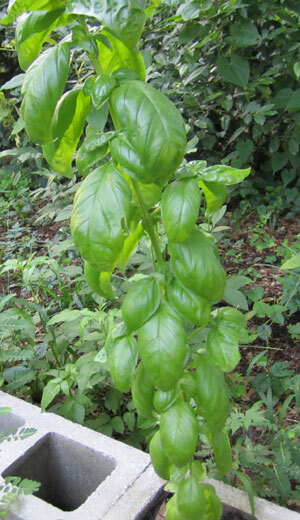 Now I’m not exactly used to cooking with basil, so I don’t really know what to use it for! I did manage to make a nice blackberry vinaigrette dressing, but otherwise I’m stumped as this is only one of about 6 basil plants that got this size. 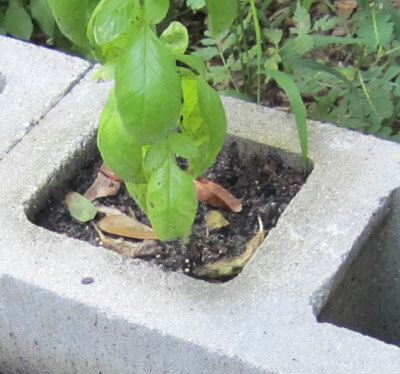 It would have been nice if some of the other herbs would grow, but I’ll consider this a good start and some experimental proof that it is possible to grow herbs in the spaces of a concrete cinder block. There is actually also a garlic plant that got to a slow start in the cinder block across from it, but it has been a little bit back and forth from sun burn and steady growth. If it survives and delivers some garlic before the frost, I’ll be sure to share that picture as well!